I am not quite sure where this post and another one I already posted (on the sevens) should go, here or in "Bianca's Garden." I asked Robert, and he said I could take my pick. Well, since I don't know what attention my post on the Sola-Busca sevens got in Bianca's realm, I will try the unicorns. The purpose of this thread (wherever it is) is to discuss the imagery of the Sola-Busca pip cards. My unicorns have the theory that the choices in imagery were in large measure influenced by Neopythagorean philosophy, and especially the Theology of Arithmetic, in the Renaissance attributed to Iamblicus, although most of its ideas derive from an earlier time, the first century before and after the beginning of the Common Era. I know that Neopythagreanism has been thought by many to be a key to interpreting the tarot in general (i.e. "The Pythagorean Tarot" among others); I want to stick to the SB pips and to historical considerations, that is, texts and images that would have been available in its own time, and so available to influence the SB pips; but also texts and images composed after its time that might have been a result of similar influence, or of the SB itself. From the latter considerations, one subsidiary question is whether the Sola-Busca pips' designs are pat of a cartomantic tradition, i.e. fortune-telling. I will begin to discuss this question at the end of this post. But first I want to look at the Theology, followed by a look at the SB Aces. In later posts I will go up the numbers, one by one, asking the same questions. The Theology of Arithmetic presented teachings deriving from early Pythagoreanism, combining it with the reigning philosophy of that time and place, Middle Platonism, and also natural science and medicine as then understood. It presented this material in a special way, in terms of numbers, in particular the numbers from one to ten. This work was not, to my knowledge, translated into Latin, and only recently into English. On the popularity of the text in the Renaissance, see Calenza, Renaissance Quarterly 1999, at http://www.accessmylibrary.com/article- ... silio.html. The title there is "Arithmetic in Theological Matters." (Added Nov. 29, 2010: For more on the accessibility of this text during the Renaissance, see my investigation at viewtopic.php?f=11&t=613.) The SB designer need not have known this work directly; selected quotes from each chapter would have been sufficient. Also important, to other SB designs, are Macrobius's Commentary on the Dream of Scipio and certain works by Plato and perhaps Aristotle. Every compound of plurality or every subdivision is given form by the monad, for decad is one and the chiliad is one, and again one-tenth is one and one-thousandth is one, and so on for all its subdivisions ad infinitum. In each of these cases there is the same monad in terms of form, yet different monads in respect of quantity, because it produces itself out of itself, as well as producing them, juas as if it were the principle of the universe and the nature of things, and because it maintains everything and forbids whatever it is present in to change, it alone of all numbers resembles the Providence which preserves everything, and is most particularly suited both to reflect the principle of God and to be likened to him, in so far as it is closest to him. The author, citing the first century Alexandrian philosopher Nichomachus, compares the properties of the Monad to God and finds that their properties "coincide," or perhaps "resemble" each other. Now the question is, can this text help us to understand the SB Aces? The SB Aces of Batons and Swords each have two figures, as opposed to Coins and Cups, which have three (I will get to them later). In Batons, we have two identical cherubs facing each other and working together to hold up a club much bigger than they are. (my source for these images is (http://www.tarotpedia.com/wiki/Sola-Busca_gallery.) In Swords, we have two different-looking figures holding up one sword, looking away from each other. Moreover, the figure on our right is decidedly effeminate. If one didn't look closely, one would think it was a woman with a broad feathered hat. The figure's ample blouse suggests breasts underneath. Even looking closely, I am not sure what the feather-like thing on top is. Besides a feather, it could be an artificial cobra, in the manner of Egyptian headdresses. It seems to me that Batons represents the union of sames, and Swords the union of differents. In Plato's Timaeus (see http://en.wikipedia.org/wiki/Timaeus_(dialogue)), "Same" and "different" are two out of three basic categories there (after the four elements); the third is "being." For the Theology, harmony is characterized as a combination of "same" and "different." The components may all be musical tones (or whatever is in harmony); but in music, harmony can be analyzed down to units in specific proportions, e.g. 2:1 (the octave), 3:2 (the fifth) 4:3 (the fourth), etc. (see "Interval" entry at wikipedia). In these two Aces, we see an emphasis on "same" in Batons and "different" in Swords; yet in each the result is a unified design. For even though the charubs of Batons are essentially "the same," yet they accidentally different, in that one is on the right facing left, and the other on the left facing right. And although the two figures in Swords are essentially different, yet they also have attributes in common, in that both are human figures on either side of a sword, facing away from the blade. Thus each Ace is in microcosm a philosophical image of one aspect of God, as that in which all opposites and sames are combined harmoniously. There is another way in which the Ace of Swords reflects a specific "unity of opposites" and humans as a microcosm of God: the Theology says that the Monad is both male and female at once" (p. 38), because it produces everything out of itself with no recourse to anything else. It is called "androgyne." 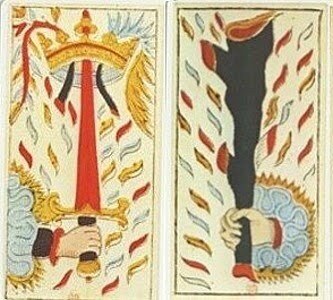 Thus we have what I see as the male and female appearances of the two figures on the Ace of Swords. 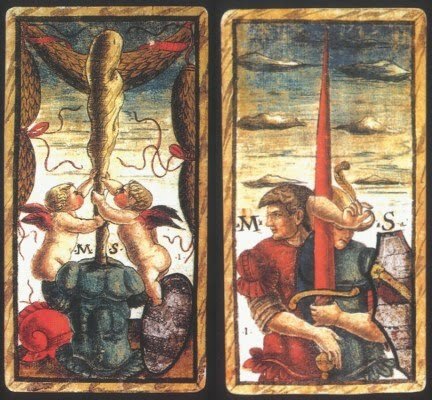 These two cards, Batons and Swords, also symbolize God in another way, more connected to Christianity. In the lower part of these cards, we have a red mass, a black mass, and a somewhat whitish mass. These are the colors of the main stages of the alchemical work. They are also, I will argue later in this post, in connection with the Ace of Coins, symbols for the persons of the Trinity. Other aspects of the Theology selections that I have quoted relate to Aces of Swords and Batons in later decks, notably the "Marseille" style. The green club of the Ace of Batons there (above) suggests the creative power of the Monad and, by analogy, God. I am not sure about the crowned sword of the Ace of Swords. If God and the Monad are creative and intelligent, perhaps the crown on the Ace of Swords relates to God's intelligence. I would have thought that the sword represents destruction; but the Theology's God does not destroy. it "forbids whatever it is present in to change." What is present in it is the eternal archetypes, apparently. The Pythagorean/Platonic idea of a Monadic God as the "form of forms," makes it the source of all perfections, the archetypes in their purest form. Such a conception is found, oddly or not, in the word lists that Papus (La Tarot Divinatoire, 1909) attributed to Etteilla (who published 1770-1791). I do not know where in Etteilla's work Papus may have found these lists. I am using the translations provided by James Revak at http://www.villarevak.org/td/td_1.htm. ACE OF BATONS UPRIGHT: Birth, Beginning.—Nativity, Origin, Creation.—Source, Principle, Primacy, New.—Extraction, Race, Family, Station [in Life], House, Lineage, Posterity, Circumstance, Cause, Reason, First, First Fruits. ACE OF SWORDS, UPRIGHT: Extreme, Big, Excessive.—Extravagant, Fierce, Carried Away.—Exceedingly, Passionately, Inordinately.—Vehemence, Animosity, Momentum, Excessiveness, Wrath, Fury, Rage.—Extremity, Bounds, Border, Limits.—Last Breath, Utmost Extremity. These epithets could perhaps fit the God of the Old Testament at his most angry and destructive, one who reappears in the Book of Revelation. It is not the Theology conception, which emphasizes preservation and deals only mainly with the archetypal world, not the physical one. COINS, UPRIGHT: Perfect Contentment, Felicity, Happiness, Rapture, Enchantment, Ecstasy, Marvel, Complete Satisfaction, Complete Joy, Inexpressible Pleasure, Color Red, Perfect Medicine, Solar Medicine, Pure, Accomplishment. This list suggests both the sun and life spent dwelling in the divine. Etteilla has another list for the "Reversed" appearance of the card: that one pertains more to the specific suit, that of money. ACE OF CUPS, UPRIGHT: Abundance, Fertility, Production, Robustness, Stability, Steadiness, Constancy, Perseverance, Continuation, Permanency, Duration, Regularity, Persistence, Confidence, Courage. The Reverseds are the opposite of these. In the above, words like "Abundance," "Fertility," and Production" might also go in a different category, relating more to Batons, as pertaining to creativity. And "courage" seems to fit Swords. The question remains, how do these lists for Coins and Cups relate to the corresponding SB cards? Well, let's see. Cups (below) has three cherubs on a cup: three on one, so to speak. Why else three, except to signify the Trinity? Admittedly, using cherubs to represent the Trinity is rather perverse; but many of the SB images are rather perverse. One of the cherubs is pouring water from a pitcher, like numerous cherubs on fountains. The other two are "angel musicians" as depicted on numerous Renaissance altarpieces. I see no relationship between these conventional poses and the Trinity; it is only the number of cherubs that is significant, and the more specific symbolism of the cherubs in Coins, which I will discuss in a moment. There is also the motto "Trahor Fatis" painted on the cup. I will talk about that motto in relation to the Ace of Coins, where it also appears. In Cups, it has no particular function that I can see, and the motto was not part of the original engravings; perhaps it is a motto favored by the patron who commissioned the painted deck (as Zucker,Illustrated Bartsch vol. 24 part 3, p. 81, suggests). So now let us look at the three cherubs' counterparts in Coins. Tarotpedia (http://www.tarotpedia.com./wiki/Ace_of_Coins_Sola-Busca) points out that the cherub on the left, holding his head in its hand, is in a characteristic pose signifying melancholy (for example in Durer's engraving with that title). and thus also the alchemical stage of the nigredo, Latin for blackening. Above this cherub is a banner, not part of the engraving but painted later; it reads, "Trahor Fatis"-- "I am drawn by Fate." Tarotpedia goes on to say that there is a comet above this cherub, traditionally a bad omen. I don't think we can conclude that it is a comet, because there is no tail, here or on the other cards where this motto and the star-like image appears (Postumo, Trump 2; Catone, trump 13). Zucker (pp. 66, 107) says it is simply a star. The motto might just mean that the cherub is ruled by Fate, whether good or ill, as opposed to its own will. There might be a reference to the Theology's Atropos, the Fate who chooses the time and manner of death. It seems to me that this cherub also represents the Father of the Trinity, in particular, the Jehovah of the Old Testament. Jehovah was identified with Saturn, the god associated with lead, blackness, and melancholy. Moreover, after Adam and Eve's sin, all humanity was condemned by God to suffer death without a return to Paradise; "Sheol" was the soul's destination, a dismal place like the Hades of the Greeks (although there was also the "bosom of Abraham" as temporary quarters for the righteous; see http://en.wikipedia.org/wiki/Sheol); such is the lot of those bound by Fate, until the advent of Jesus. The center cherub triumphantly carries a coin that is bigger than it is. Around the coin is painted the motto,"Servir. Chi persevera infin otiene"--"To serve. If you persist you obtain [your goal] in the end." 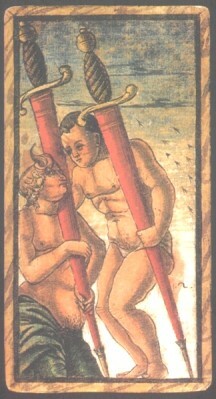 Tarotpedia interprets the ox skull as connoting hard, persistent work, thus relating to the motto. The coin is probably golden, and hence signifies the rubedo in alchemy. It seems to me that this cherub also signifies the Son of the Trinity. It is because of the crucifixion that humanity can now, through faith and good works, rise above Fate and return to Paradise. That is the main goal which persistence and hard work attain. 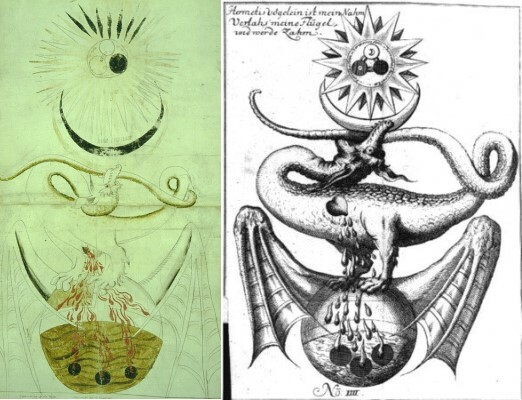 Even in alchemy, the rubedo was associated with the Son. For example George Ripley's Cantilena ends with the elevation of the "ruddy son" and his mother (Fabricius, Alchemy, p. 134f, also Jung, Mysterium Coniunctionis, p. 283). An English cleric, Ripley was in Italy 1457-1477, according to Wikipedia. 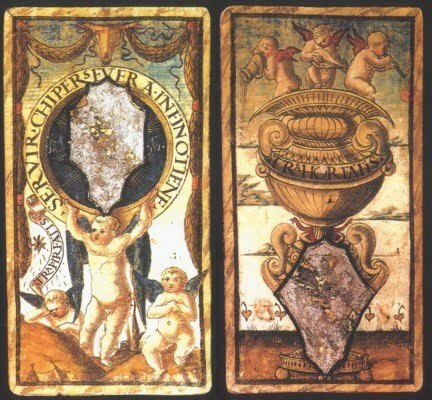 Tarotpedia says that the cherub on the right probably represents the albedo in alchemy, which occurs between the nigredo at he beginning and the rubedo at the end. 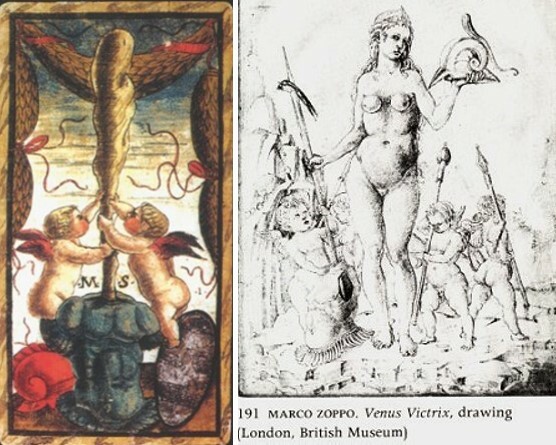 Since there is white space above this cherub and the other two cherubs represent the two other major stages of the alchemical work, this hypothesis is reasonable. It seems to me that this cherub also represents the Holy Spirit. For one thing, it was conventionally represented by a dove, which is white. For another, Jesus was conventionally shown praying when he received the Holy Spirit at his baptism, just as the cherub is on the card. Another example that supports my hypothesis is the early-15th century "Ripley Scrowle." Tarotpedia applies one version of the particular image I have in mind to the Three of Swords (http://www.tarotpedia.com/wiki/Three_of ... Sola-Busca). I think it fits here as well. The image on Tarotpedia is in color (or was, as it seems now, when I look, to have disappeared entirely), and it says XVII century. I have not so far confirmed that dating; their reference, to Adam MacLean's site (http://www.levity.com/alchemy/rscroll.html) is to an image that appears there in black and white and undated. A similar one in black and white is from 1715 (http://hdelboy.club.fr/gravures.html; search "Ripley Scrowle," and the image is "IV" in the series). There is also a 15th century image (http://hdelboy.club.fr/gravures.html, clicking on "IV" of the "Erskine Roll"), which is more primitive, shown in green and white below, to the left of the other one. What interests me is not the three circles at the bottom, which Tarotpedia focuses on for the Threes, but the three at the top; I have reproduced these details in the second pair of images below. In the 15th century image, two of the circles are white, one black. By 1715 the two white ones are further differentiated (as they are on MacLean's image); I suspect that the meaning was the same in the 15th century: what we see is a black circle for the Father, a white one for the Holy Spirit, and a third circle (white in the version below, but light-colored on levity.com) with a dot in it, the symbol of the sun, for the Son. I think that Coins provides us with the most specific correspondence between the "Etteilla" list and the corresponding SB card. Namely, the large coin held by the center cherub, the one representing Jesus, connotes the "sunny" (i.e. happy) attributes of the person whose life, after death and some of the time on earth, is spent with Jesus. Moreover, the "Etteilla" word "redness" might correspond to rubedo stage of alchemy; and it certainly corresponds to Jesus as the rising sun of the second coming. 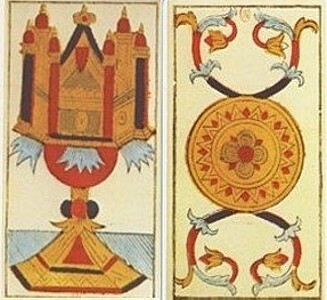 Other early Aces of Cups and Coins reflect the Christian God even better than the Sola-Busca: in Cups, the baptismal font or communion cup; in Coins, the single yellow circle reminiscent of the sun, with vines growing out of it, reminiscent of the sun's power to stimulate vegetative growth. In footnote 39, the translator gives as Cusa's probable source John of Salisbury's De Septem Septenis VII (PL 199.961C). This text, as far as I can determine, is only available in Latin. I managed to locate it on-line using my local library's First Search search engine (from WorldCat). It is in volume 5 of Joannis Saresberiensis' Opera Omnia, p. 233. The translator adds in footnote 43 that by "union" he is translating Cusa's "conexio" and "unio," which Cusa uses interchangeably. All that is missing is the notion that the second and third persons "proceed" from the first. That the One "generates" Equality is the subject of Cusa's Chapter 8. That Union "proceeds" from Unity and Equality is the subject of his Chapter 9. Can this doctrine be derived from any Pythagorean writing? In fact "equality" is declared a property of the Dyad in the Theology of Arithmetic. Cusa and Salisbury are simply appropriating it for the second person of the Trinity. "Union"--the combination the Monad and the Dyad--is a property of the Triad, which they are appropriating for the third person of the Trinity. What Cusa is doing is attempting to show that since all three, Unity, Equality, and Union are are eternal, are all descriptive of the one God, a proof of the Trinity derived from "Pythagoras." Whether the Theology is the source, or some summary of the relevant portions (only its first three chapters) I do not know. I also do not know what Salisbury is referring to in citing Augustine. There are no scholarly notes to the Septem Septenis as published (in 1848). In this case, there might be an alternative interpretation of the Ace of Swords. That is, the two figures on each side of the sword, different in appearance but doing the same thing on the same level, might represent "the Equal," and so the second person of the Trinity, the one who came not to bring peace, but the sword. The two identical putti on the Ace of Batons, however, are still "the Same." In Chapter Nine (http://my.pclink.com/~allchin/1814/retrial/cusa2.pdf, p. 15), Cusa goes on to identify "union" with "the same." It is well known that Waite and Smith borrowed ideas both from "Etteilla" and from the Sola-Busca. How Waite (1910) borrowed from the "Etteilla" word-lists (Papus, La Tarot Divinatoire 1909) is shown on James Revak's site, http://www.villarevak.org/td/td_1.htm. In the case of the SB Aces, Waite borrows mostly from the Marseille style, in as much as all of the Waite-Smith Aces have a hand coming out of a cloud--the hand of God, we are to assume (see below). Only in the Ace of Cups do I see the SB, in that all three persons of the Trinity are represented: the hand of the Father, the cup and Omega of the Son, and the dove of the Holy Spirit. The Theology's reflections on the Monad may also say something about trump number one. I don't know about the Sola Busca trumps, but I do see an association to the more traditional trump of the Bateleur. Like the Monad, he is the "creative intelligence" that is source of the archetypes, in that he has representatives of the four suits on his table, which are the four elements and also the first ten numbers, out of which the whole 78 may perhaps be constructed. Also, some writers have associated the Bateleur with the sun, which is the Monad's planet. Finally, I want to say something about cartomancy. Given that the Etteilla cartomantic interpretations are reflective of aspects of perfection and God, one may wonder whether the SB pips are themselves part of a cartomantic tradition. Etteilla emphasized that he did not make up the tradition he was describing; rather, he learned it from one or more Italians. (He may, however, have invented the term "cartomancy.") Moreover, Pythagoras at the time of the SB was traditionally associated with prophecy. Besides the ancient texts about him, there was in Venice e.g. the "Wheel of Pythagoras," in which, starting from personal information such as name or birthdate, the cartomancer looked on a wheel for letter-number correspondences and computed a number between 1 and 30 answering "yes" or "no" to the querent's question (Heninger, Touches of Sweet Harmony: Pythagorean Cosmology and Renaissance Poetics, p. 238; in "The Sevens" I posted an image of the wheel). Huson in Mystical Tarot gives other examples, some with cards, from the half century before to the half century after 1500 in Venice and elsewhere; see his section on sortilege (pp. 43-51, in Google Books). However, the Aces aren't the best examples of correspondences between the SB imagery and the "Etteilla" word-lists. The only consistent correspondence is the very general one between the SB as reflecting attributes of the Neopythagorean God of the Theology and the "Etteilla" lists also reflecting attributes of God or the divine; but in "Etteilla" (unlike SB Batons and Swords) the conception is more Christian than Neopythagorean. However SB Coins and Cups also reflect the Christian God, although in a different way than Etteilla's lists (which have nothing to do with the Trinity per se). The only more specific correspondence I see is in the Ace of Coins: the golden coin held by the central cherub is the most conspicuous part of the card, corresponding to the sunny (i.e. happy) attributes in the "Etteilla" list, which also includes the "redness" of the alchemical rubedo. Hello Mike, I am very interested in this subject. I will try to explain my point of view. My idea is that the meaning of the pips should be based on a meaning of the suits. Ancient documents about Tarot usually give a meaning to the suits and do not stress the meaning of the numbers (I am thinking of Boiardo, Piscina, the Anonymous). The pips are just elements of a sequence illustrating the concept represented by the suit. It seems to me that a possible meaning of the Sola Busca suits is an allegory of the four humours or temperaments. Something we discussed an year ago in this thread and that you also mentioned about the sevens. One thing I like in this idea is that it is pretty obvious. The four temperaments were a common concept in the XV century. Also, at least the association of Swords with the Cholericus and Cups with the Phlegmaticus are very direct. The other two suits are more problematic, since it is not even clear what the suit symbols are. I am not particular confident that this hypothesis makes sense, but I think that the best method to attempt an interpretation is to start from the suits, and then move to specific cards. I attach a table that illustrates the court cards that I think reasonably match (light blue is for the cards for which I found no match, the other colours correspond to the temperaments). The association has a few serious problems, e.g. the lions (typically associated to the Cholericus) in the King of Batons, the lute (associated to the Sanguineus or the Phlegmaticus) in the Page of Swords. I also attach a few images from “Saturn and Melancholy” by Klibansky, Panofsky and Saxl. The top row is intended to illustrate the Pages in particular. 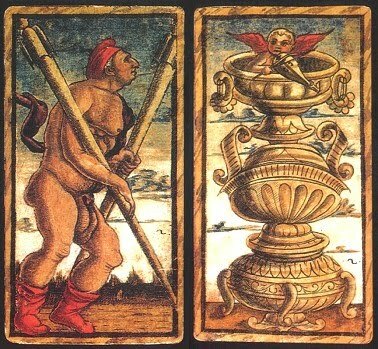 The other two images suggest an interpretation for the Three of Swords (the pierced heart) and the Ace and Two of Cups (putti playing instruments and pouring water). Wonderful images of the four temperaments! «Si può dire, che nel giuoco delle carte s’intendano le quattro Stagioni dell’anno. Le spade indicano la primavera, nella quale tutti i Principi muovono l’armi. I denari figurano l’Estate, nella quale si raccolgono i grani, e l’entrate. Le coppe ripiene di vino significano l’Autunno. I bastoni sono simbolo del Verno, perché gli alberi del Verno sono nudi a guisa di bastoni. Tanto più, che nel verno sono necessari i bastoni per iscaldarsi». I am not aware of an interpretation that directly links the four suits to the four humours. Maybe Ross can suggest something about this, since he is familiar with ancient moralizations of standard playing cards. The Anonymous quotes the four temperaments, but he does not link them to the suits. I like Loredano's interpretation We discussed it here a few months ago. Thank you, Marco. I totally agree with your assignment of humors to suits, at least for the Marseille-style decks. I have, I think, verified these assignments for the Marseille court cards; see the last page of the thread "Crackpot Theories," second post (for some reason the computer I am using, away from home, does not let me copy the url, ata least not in the way I know). For the Sola-Busca, I was trying a more empirical approach to the pips, just looking at the cards themselves and the literature that was available on numbers then. I am not sure how consistently the SB correlates the four humors with the four suits, or how informative they are in explaining the specific imagery in the SB. At least three humors are involved in the SB Ace of Coins. And for Cups, "phlegmatic" indeed fits, but why three cherubs rather than one for "phlegmatic"? However "choleric" might explain why the two figures are looking away from each other in Swords; and "sanguine" might explain why the two cherubs in Batons are helping each other. I will try systematically assigning humors to pip cards according to suit, and see how it helps. I know it helps in the case of the Sevens and somewhat the Aces. I am going to be out of town for a week, with little access to a computer, so expect a delay in my responses. marco wrote: Maybe Ross can suggest something about this, since he is familiar with ancient moralizations of standard playing cards. — The Tiles, [Diamonds] which are depicted on the cards, signify the earth: for just as the earth sustains all heavy things, so the tiles are used to bear the heavy things placed on top of them. — The Clovers, [Clubs] which are depicted on the cards, represent water: for the reason that the clover is an herb that flourishes in moist places, and is nourished by means of the water that makes it grow. — The Hearts, which are depicted on the cards, signifies to us air: since our hearts could not live without air. (cité par Franco Pratesi, dans "As de trèfle", juillet 1992) Observons que les relations données par Gosselin entre les enseignes et les éléments sont différents de celles proposées dans ces pages, et largement admises : terre/carreau, eau/coeur, air/pique, feu/trèfle. Par ailleurs, dans les jeux de Ringhieri se trouve exprimée une relation entre les enseignes des cartes et les vertus : Coppe/Tempérance, Colonne/Force, Spade/Justice, Specchi/Prudence (voir Ringhieri, 1551, jeu LXXXI)". I don't have a clue what to do with the Sola Busca suits, elementally speaking. Marco's assignation looks good to me. It seems to me that whether you assign the element first or the humour first, the other will follow, since there must have been a standard and traditional association of element x=humour x. Thus Ringhieri and Gosselin agree on Fire=Piques/Spade=Justice/Choleric, and agree on Air=Hearts/Cups=Temperance/Sanguine (strange coincidence!) but would disagree on the other two, based on standard Latin suit-French suit equivalences (since Ringhieri's "specchi" must be Denari or coins, usually taken to be equivalent to Carreaux/Diamonds). I'm back--partly. That is, I moved and don't yet have Internet at my new place. So I use the library's computer, when I can. I am not much impressed by the sources that Ross cited--well, I am impressed that he had them at his fingertips, just not that they are very useful; I wonder if they represent anything other than their own fancies. I would rather look at the imagery on the cards themselves and see what fits, as Marco has done for the Sola-Busca courts. His schema doesn't fit exactly, as he points out. Perhaps the artist took liberties with the program as given to him by the patron. In applying it to the SB pips, I see that I messed up the correspondences in my earlier post, applying it to the Aces. I had Batons as Sanguine and Discs as Melancholic, when Marco's schema was the other way around. Marco's correspondences now fit the Ace of Discs, which, as I see it, has a cherub representing the Son holding the single disc aloft. In the Trinity, it is the Son that makes it possible for mortals to enter Heaven, a Sanguine outcome indeed. However now it is not clear why two cherubs holding up a club should express Melancholia. They look Sanguine to me, if anything. Also, I think that with the Ace of Batons the artist or designer is emphasizing the idea of the "union of sames," as opposed to the "union of opposites," and showing how like-minded cooperation achieves more than contrary-minded opposition. This perspective fits the Sanguine temperament more than the Melancholy. It seems to me that the artist has taken liberties with the schema, if there is one, giving the Aces two Sanguine images and no Melancholic one. Such an emphasis on the Sanguine might have been seen as fitting for a number whose dominant theme is God. Although even the Judeo-Christian God has his melancholy aspect. Human beings are such a disappointment. But I don't see it in the Aces. Much has been written about the Sola-Busca 2 of Coins. One theory is that it represents the friendship between Ercole d’Este and Savonarola. But the portraits don’t correspond well to their known portraits. Huck suggested once on ATF (now on Tarot History Forum as viewtopic.php?f=14&t=538#p7439) that the upper one was of Ercole’s son Alfonso, who at least had a beard. Some, like art historian Mark Zucker (Illustrated Bartsch vol. 23, part 3, p. 107), say that the portraits are purely imaginary. ...There is a portrait of a man crowned with laurel on the upper medallion, on the lower one, a man with the hat of a merchant. 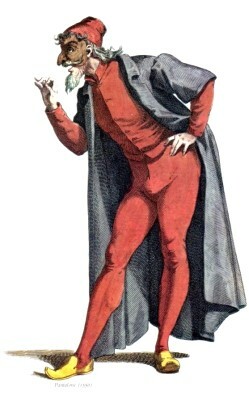 That the lower medallion might show the hat of a merchant can be seen if one compares it with the hat given to the Commedia dell’Arte figure Pantalone (see Wikipedia). This character was an elderly wealthy merchant and conventionally spoke in Venetian dialect; hence it is the hat associated with Venetian merchants. It is different from the headgear depicted for merchants at the Schifanoia Palace in Ferrara (which is similar to that of the “Merchant” card in the “Tarot of Mantegna”). Hind (quoted by Huck) thought the hat was that of a student. But pictures of “young gentlemen” in 15th century Italy do not show them with such hats (search “young Venetian gentlemen” at http://www.costumes.org/classes/fashion ... dieval.htm). It is also different from Savoranola’s cowl, shown in all the portraits that don’t have him bare-headed. I am aware that many people identify the Sola-Busca as stylistically Ferrarese rather than Venetian. But I see no basis for this preference. 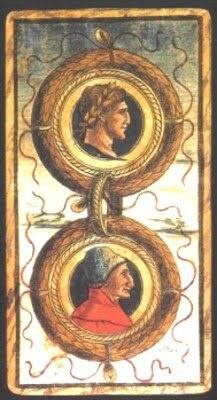 In style the SB is closest to the “Parchment Book” of Marco Zoppo, as Tarotpedia illustrates in a few examples, out of many that could be given. 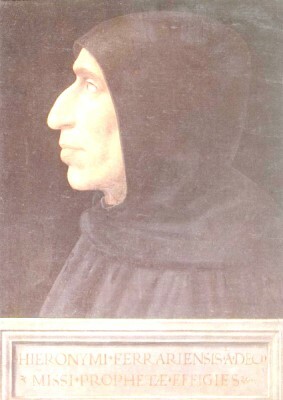 Zoppo spent the last decade of his life, 1468-1478, in Venice. Although influenced by Ferrara, he never lived there. It is possible, as Ruhmer (Marco Zoppo , 1966) suggested, that Zoppo did painted prototypes for the 1491 (or later) engravings; and if not him, then someone after him. Zucker puts the artist “somewhere between the generation of Tura and Zoppo on the one hand and that of such first-generation High Renaissance Emilian painters as Amico Aspertini and Locovico Mazzlino on the other” (p. 66; I am giving the full quote because Huck, in another post now reprinted on the Exhibition Gallery thread, appears to misquote Zucker slightly). Another indication of Venice is the proliferating putti; illuminations done for Venetian patrons show many such putti, unlike those for Ferrara. Zoppo’s drawings, which the experts agree were probably done for a Venetian patron, are full of them. From the standpoint of the Theology of Arithmetic, the headgear is the most meaningful part of the two medallions. The laurel represents Apollo and victory, hence excellence derived from conformity to the eternal archetypes physically, aesthetically, intellectually, and morally. The Italian aristocracy saw its model in the philosopher-kings of Plato’s Republic. Similarly when Ophelia sees in Hamlet as the “courtier’s, soldier’s, scholar’s, eye, tongue sword” (3.1.153), she is seeing him in the terms of Castiglione’s Courtier, set in 1507 Urbino. It is these rulers, secular and clerical alike, who have their eye on the ideal and suppose that they are ruling accordingly. Lower down in the Republic’s class system are the merchants, who are motivated not by ideals but by material riches. The contrast is that between Form and Matter. It is precisely with the Dyad that Matter enters the unfolding universe of the Theology of Arithmetic, characterized similarly (pp. 44-45) to how the merchants are characterized in the Republic. It is also called ‘deficiency and excess’ and ‘matter’ (for which, in fact another term is the ‘indefinite dyad’) because it is in itself devoid of shape and form and any limitation, but is capable of being limited and made definite by reason and skill. The dyad is clearly formless, because the infinite sequence of polygons arise in actuality from triangularity and the triad, while as a result of the monad everything is together in potential, and no rectilinear figure consists of two straight lines or two angles. So what is indefinite and formless falls under the dyad alone. The dyad is also an element in the composition of all things, an element which is opposed to the monad, and for this reason the dyad is perpetually subordinate to the monad, as matter is to form. It is the partnership of the ideal and the material, with aristocratic ideals ruling, that the Republic of Venice saw itself as embodying; hence the paired medallions, with the merchant on the bottom. Without ideals ruling, embodied by the patricians, the merchants’ greed would know no limits and result in general unhappiness; only the limits imposed by form and ideals promote happiness. Correspondingly, the partnership of the Monad and the Dyad, under the rule of the Monad, results in the Triad, symbolic of enformed matter. This partnership was merely potential in the Monad and contained within it, as illustrated in the Ace of Swords, in which male and female exist as one but in opposition, the union of differents or opposites. In the Dyad the two break apart, to be unified in a new synthesis in the Triad. The dyad gets its name from passing through or asunder (translator’s explanation: Duas [dyad] is here linked with dia [through or asunder]), for the dyad is the first to have separated itself from the monad, whence also it is called ‘daring.’ For when the monad manifests unification, the dyad steals in and manifests separation. The Two of Swords expresses this aspect of the Dyad in comic form. The young man is filled with trepidation; the older man is to support his act of courage and daring. That what is involved is separation from the Monad is indicated by the birds. To follow the birds is to take a journey, to separate from one’s place of origin (Sofia Di Vincenzo makes this point), even if the result is a “wild goose chase,” as we say, a journey that does not achieve its end. 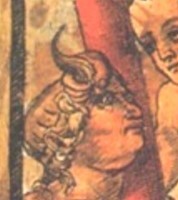 On the older man’s head is a curl that is most likely a horn but also suggests a lock of hair. Forelocks represent opportunity to be seized in Renaissance symbolism (James Hall, Dictionary of Subjects and Symbols in Art, p. 229, in Google Books). So in Cups we have a putto playing a violin, looking upwards. It is reminiscent of the courting lover serenading his beloved below her window. Their eventual union will result in enformed matter, as expressed in the Triad onward. Unfortunately I do not see how to apply the "four temperaments" theory to these cards. The figures all look to me rather melancholy, or at least anxious, except the one in the top medallion of Coins.